Amid the murmurings that followed Kevin's brilliant post on what used to be a private and quiet Christmas tradition in St. Pete (well, maybe not quiet), a heard a voice calling out for a good Christmas cookie recipe. Well, here's the best one I have. 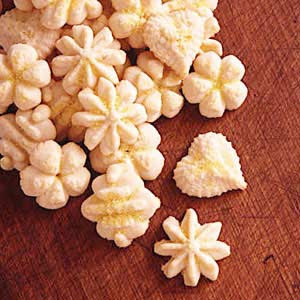 I love shortbread with something that borders on an obsession and I played around with if for years until I perfected a recipe that produces a buttery, somewhat salty, somewhat sweet and perfectly sand textured shortbread. The ingredients couldn't be simpler, the art to this one comes from the perfect oven temperature and time spent therein. I used to try to make these with a spoon, but they have to be of a uniform thickness or they won't have the right texture. On a lark I bought a cookie gun one year and it yielded the perfect shortbread cookie. Who knew? Some people call them cookie presses, but I call it a cookie gun. It makes me feel more macho that way. 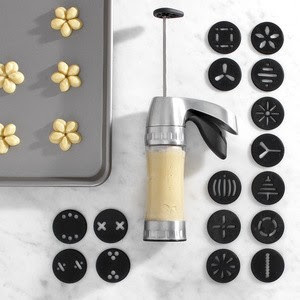 Anyhow, I bought a Wilton Cookie Press (gun! it's a gun!) Pro Ultra 2. It's perfect --plenty of shapes and it's easy to load and clean. Whip butter with an electric mixer until fluffy. Stir in the confectioners' sugar, cornstarch, and flour. Beat on low for one minute, then on high for 3 to 4 minutes. Drop cookies by spoonfuls 2 inches apart on an ungreased cookie sheet. Bake for 8 minutes in the preheated oven. Watch them like a hawk. Pull them out of the oven at precisely 8 minutes or they will scorch. Once they're out of the oven let them cool for a couple of minutes and then transfer them to a cooling rack. Sprinkle them with powdered sugar while they are still hot if you'd like. That recipe will make enough shortbread to feed an army but fear not. Take the extras, throw them in a food processor, grind 'em up and make an amazing crust for a cheesecake. yum. though i'm afraid 4 ingredients is still too advanced for me! Awww, you can handle it Christian. The gun does all the work. If you can turn on an oven, you can make these things. I hate you Paul.. now I have to make MORE cookies.. These things make themselves, trust me. I just read Bitchlexia. Were it not for your comment I'd have never known it existed. Fantastic name, fantastic points raised. Keep at it! Well, my cohort and I write ALL day long so sometimes it's hard to have the time for our end of the day venting. Hoping that once the evil cookie-and-chocolate-eating holidays are over we'll have more time though. BTW, AT is having some favourite website contest and I was forced to nominate you for my favourite design blog out of an overwhelming sense of irony. I laughed, more than a little, on the inside when I did it. Oh that is ironic. Thank you. Actually, that's hilarious. Oh, I need to stuff that ballot box now. I need to win this. I want to force them to give an award to the man who's made a virtual career out of mocking them at every opportunity. Mwah hah hah. I like your sense of humor and I'm glad you left a comment. It's a pleasure to meet you if that's what this can be called. I just subscribed to your feed so I'll be monitoring Bitchlexia to see where it goes after cookie and chocolate eating time is over. You made them! Outstanding! Dip them in dark chocolate some time if you're looking for an extra thrill!